We meet on the first Wednesday of every month where we have a talk on a particular subject and then congregate in a pub afterwards. Meetings are announced through the mailing list and social media. We meet at DoES Liverpool which is located on the 1st Floor in the Tapestry, 68-76 Kempston St in the City Centre at 7.00pm for a 7.30pm start. 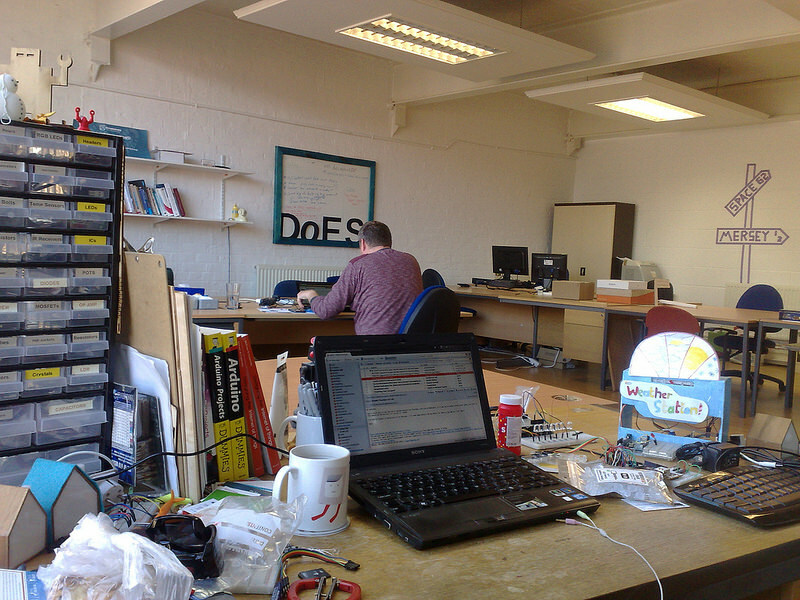 DoES Liverpool is a thriving local tech hub, hackerspace, co-working space and so much more. They have brilliant facilities and we’re very grateful of their support. There’s some good directions to find the place on their website and also a great explanation of the community and the philosophy behind it, plus their amazing workshop full of lovely things such as 3D printers and laser cutters. After the talk (or if there’s no talk then after some chit-chat) we venture to one of the local drinking establishments. is this an open event or is a membership free payable? Many thanks? Can I ask where and when the next meet is? Hello, is the next LUG tomorrow evening @Gostin’s? Hi Robert, yes our next meeting is Wednesday Jan 4th 2017 @ 7pm in Gostin’s Building. I’m just about to post about it actually. I would like to attend on the next meeting. I’m an absolute beginner looking to improve my knowledge and meet some people with common interests. All are welcome, we look forward to seeing you. Please note that due to the closeness to New Year, the January 2019 meeting will take place on the 9th, not the 2nd. Thanks for the reply Neil. Should I bring my laptop? Also, I have an amputation of the leg, is there a lot stairs to climb? Yes to the laptop. Yes to the stairs, it’s on the first floor, but there is a lift AFAIR. First floor is fine on the stairs for me. 5th is a different story! haha, but I suppose that would be the same for anyone. Excellent, I’ll bring my laptop; it’s a 7 year old codger but still going strong! Thanks for letting me Dan. I do apologies for not coming last night. A family engagement imposed itself. Do you guys meet on any other nights e.g. down the pub? Hi Dan. Sorry, I missed this message. Sounds interested. I’ll send you an email. 1 Pings/Trackbacks for "Meeting Details"